A trip to Fenway is special. There is nothing like it on this planet when you set foot inside Fenway Park. For some it is that first visit that you never forget. For others, every single time you step inside and see the field unfold before you, it's special. 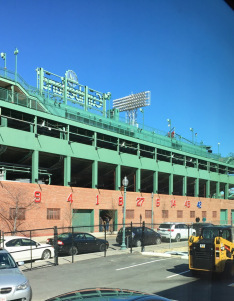 As an Overseas Fan living in Europe, I am often asked about the top things to see at Fenway Park when friends are planning a visit to the Red Sox. 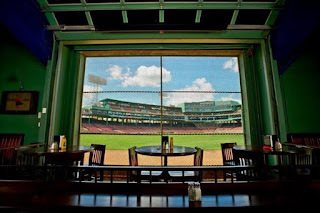 The following list of five top things to see when you visit Fenway Park, either the first time or for the tenth time, are based on some of the more special things you will find there. They are based on years of attending games, taking tours, guiding VIP events and just plain being a baseball fan. They're not the first things that you might think of when you go to a Red Sox game, but they encompass some memorable experiences accumulated over the years. There has been a lot written and spoken about the large wall located in left field that is the Green Monster. There are some neat things to consider on your trip to Fenway with regards to the Green Monster, starting with the color. Did you know that this green used to paint all of Fenway Park is copyrighted? 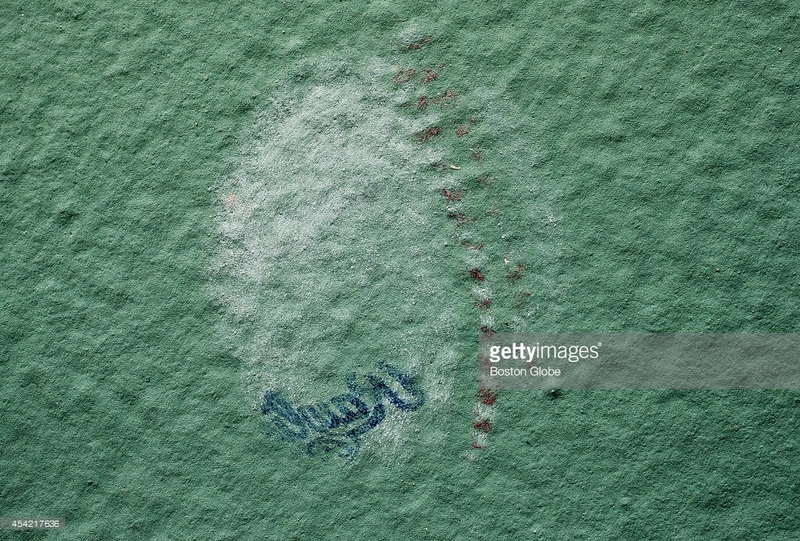 It is produced by the paint company Benjamin Moore and includes a line of paints that covers all colors found in Fenway, such as the yellow foul poles. It is a must for any visit to get up on to the Green Monster, but this can cost anywhere from hundreds to thousands of dollars for a seat during the game. 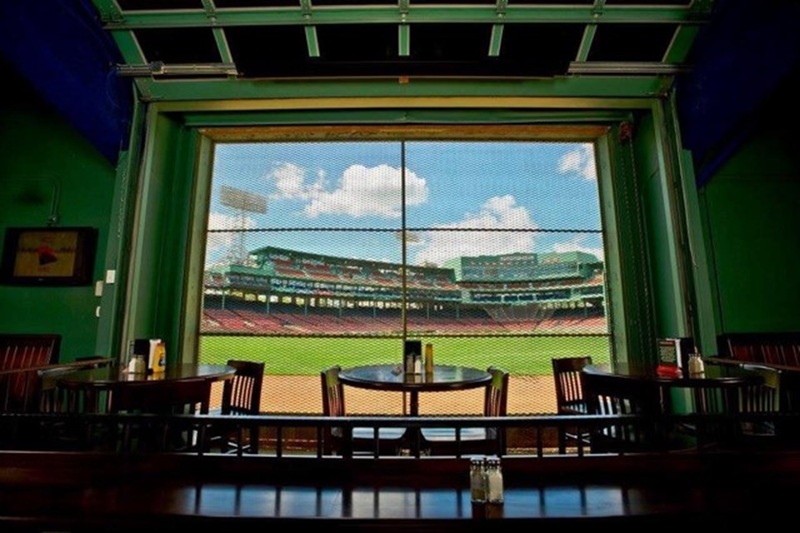 A more cost-effective way to enjoy that view is to become a member of Red Sox Nation, the fan club, for $14.95 a year. This includes the privilege of entering games two and half hours before they start through outfield gate C. You can view batting practice from the Green Monster and maybe catch a few balls to take home. Remember, it's customary as an adult to give a caught ball to some child located near you, try it, the smile you receive from that child will be one of the highlights of your Fenway trip. 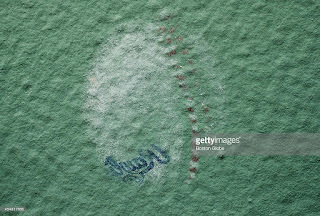 Another interesting fact is about all the dents you can see if you look down the face of the Green Monster while watching batting practice, be careful as it's a 37 foot drop to the field. These have been caused by players, both past and present, hitting balls off the wall. You might wonder how many of these dents there are in the Green Monster? Believe it or not, this is a pretty hot topic of conversation among Fenway fans and the local newspaper The Boston Globe actually hand counted them. Turns out there are a few facts worth mentioning around this venture to count the dents. First, they are officially known as dimples by the groundskeepers who maintain the field, as they don't like the Yankee player Buckey Dent who hit a homer into the netting in left field to beat the Red Sox in a 1978 playoff game. Second, even the Globe count had to use some estimation due to balls having hit the same spot multiple times. They ended up counting 33 of the 116 2-foot wide panels that make up the Green Monster and using calculations to estimate the rest. Guesses have ranged all over the spectrum, but the Globe came up with 211,004 in August of 2014. What would that number be now? There are some strange seats you can purchase through a game day ticket, ones that won't even let you see the field of play due to iron girders in your line of sight. The thing is, Fenway Park is a very old baseball park. It was built in 1912, refurbished in 1934 and has reached monument status. It seats 37,731 in the evening when they remove the black tarp on the centerfield seating and 37,281 during day games. When you are sitting in Fenway Park, you can almost feel the ghosts of past years when men would attend games wearing dark fedoras and smoke big cigars. The seats have remained the same, wooden constructions throughout the years. There is one special seat in the right field bleachers that is red, a single red seat in section 42, row 37, seat 21 to be precise. This seat represents where the longest home run ever hit at Fenway Park landed. It is over 535 feet from home plate and was hit on June 10th, 1946 by Ted Williams. You can look it up on the front page of the Boston Globe featuring a picture of Joseph Boucher holding the straw hat that Ted Williams’s blast punctured while he sat in the famous seat. Bleacher Bar seating in centerfield. If you are unable to pay for or find a ticket to the game, head down to the Bleacher Bar located under the centerfield bleachers. You can enjoy the game from their garage door window that is located about 30 feet from the player in center field. Finally, no matter where you sit, take the time later in a game to walk around Fenway and view the game from other locations. Often seats will start to empty out down lower and after the sixth or seventh inning you can walk down to a closer seat to occupy vacated seating. This is a nice feature of Fenway Park, allowing fans to truly enjoy their experiences at Fenway Park in so many ways. The pitchers not starting in a game will reside and warm up in the area out against the right field bleachers called the bullpens. You can purchase front row seating there in section 41 to set right on the Red Sox bullpen. This puts you within a few feet of the professional pitchers that throw a baseball in the 90+ MPH range. Something to see up close! Field gravel found at base of trees. This gives you view of pitchers warming up, stretching and maybe even have a bit of a chat with them before the game starts. It is not allowed to ask for autographs during the game, as they are working, but before and after they are often willing to talk. If you have a child with you, the chances of being given a piece of bubble-gum from the player stash or a ball after the bullpen catchers warm up a pitcher going into the game are good. Be respectful and you will have a signature on your cap before you know it. This is probably my favorite tip, as everyone wants a piece of the field from Fenway. If you reach over the wall and try to take some gravel from the field, you will at the very least be reprimanded and at the worst ejected from Fenway for the day. 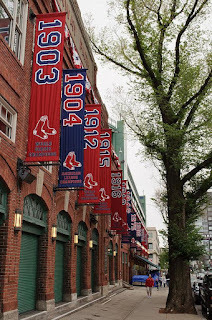 Instead of going through all that trouble, take a stroll down Yawkey Way and look close at the gravel around the trees growing there. It is the same gravel used by the groundskeepers who maintain the field inside! Look for the manager's office windows. Be nice though and just take a little, there is no reason to be greedy. Be careful not to take any dog 'presents' or cigarette butts with you. 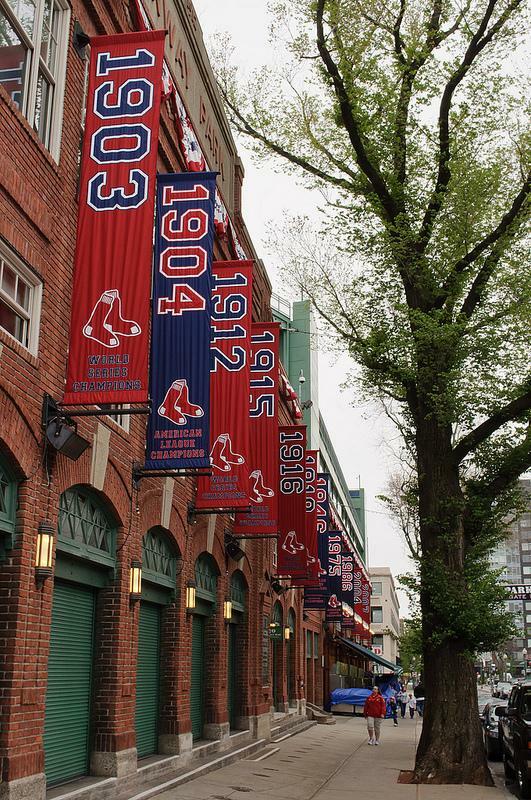 Be sure to take a walk around Fenway Park before and after the game. The streets are filled with activity and are almost as historical as the park itself. Lansdowne Street puts you under the Green Monster, Van Ness Street which is closed off to provide player parking, and Yawkee Way which includes too much to name but also ESPN / NESN live pre- and post-game broadcasting booths. If you are walking down Van Ness Street toward Jersey Street, notice there are opaque windows protected by diamond-patterned metal grates along Fenway Park. These lead to all manner of storage, batting cages and other nooks inside Fenway Park. There are two very special windows in that row. If you can find them and knock on them politely, you could come face-to-face with the Red Sox Manager John Farrell. These are part of his office and who knows, maybe you can suggest some improvements as he fills out the lineup for the game? There is nothing like a visit to Fenway Park. 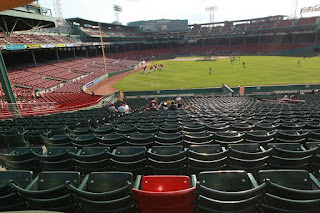 Hopefully these tips will give you the special view of Fenway at your next Red Sox game.